Ganache is a mixture of chocolate and cream, which is blended until a soft, melting and decadently rich texture is attained. For the newest addition to Guerlain’s L’Art et la Matiere collection, which already includes Angélique Noire, Bois d’Arménie, Rose Barbare, and Cuir Beluga, perfumer Thierry Wasser took the richness of ganache as inspiration for an iris scent. If you are a regular visitor to Bois de Jasmin’s pages, you already know of my fascination with the iris note. I find the scent derived from iris roots quite beguiling—it is half way between flower and root, vegetal matter and mineral dust. Discovering Iris Ganache was quite an interesting experience. It proved that iris, when made overly sweet, can lose its elegant character and assume quite a flamboyant demeanor. Iris Ganache does not indulge in mystery. Once the soft grey iris gives way to the vanillic richness and creamy woods, the composition calls to mind gold, furs and red lipstick, rather than some vision of understated glamour. The spicy floral accord blooms in its heart foiled by the fudge like richness of the oriental base—tonka bean, vanilla, amber and milky woods. Iris Ganache is very much reminiscent of Insolence given their oriental bases and pronounced sweetness. However, while Insolence is filled with strawberry fizz, which somewhat cheapens its initial effect, Iris Ganache is all about luxury with a capital L.
In some ways, Iris Ganache is related to L’Heure Bleue, the grand Guerlain classic that has few rivals both for its remarkable sillage (the trail left by its wearer) and its glamorous aura. Apparently, Sylvaine Delacourte, the creative director of Guerlain, has always loved this fragrance, which explains L’Heure Bleue’s recent revival in various guises. Yet, I find that the delicate balance of powder, sweetness and opulence of L’Heure Bleue is not to be found in Iris Ganache. I waited for something to lift its heft and cloying richness, but nothing did. It remained beautiful, yet passionless. Iris Ganache includes note of bergamot, iris butter, white chocolate, floral notes, cinnamon, patchouli, white musks, cedarwood and vanilla. 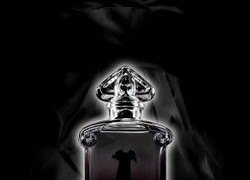 Guerlain is available from 68, Champs Elysées Guerlain flagship store in Paris as well as Bergdorf Goodman. Happy Belated Easter ~~ What scent did you choose on this special holiday – it’s Spring – but winterish. I related to your as always beautifully written review of Iris Ganache. I just sampled it las t week at BG – it lasted the whole day – it’s warm , sensual richness reminiscemt of Iris – to ne sure – served up in a delicious nutty, vanilla trace. I really was impressed . I would have bought it – had it been available. I liked it better than Cuir Beluga – it is sweeter and softer – probablt dur to the iris accord. chayaruchama: Good morning, dear Vika ! I hope your Easter was a nourishing one, dusa moja. I enjoyed this on the strip at Sniffa last week, but didn’t spray [ I was too preoccupied with orgiastic spasms of alternative Guerlain lust, I fear, to which I heartily succumbed- Vega, Sous le Vent, Liu, and Cuir Beluga- naughty, naughty me…]. I just hate when a perfume is a step away from being perfect, when it includes all the notes one craves but sadly lacks that something to lift the heft off the composition and make it breathe. Still, I’d love to try Iris Ganache because, as you know, we share a love of iris. Anyway, sorry for the long post. I just wanted to say you were bang on – it does have my name written all over it, there, just below the title 🙂 Oh, I need a backup bottle. On a brighter note, I just received a very special package in the mail: Vintage Chant d’Aromes in a rosebud bottle. It is quite beautiful to behold. Some may not enjoy the Iris Fragrance but I did do a little internet digging and came across this gem. http://www.Vivre.com All of the above mentioned L’Art de Matiere Collection fragrances can be purchased here. And it does seem to run a bit cheaper than the fragrance peddlers on Ebay. But in a way, being out in the cold reminded me of the hottest drink I have ever had: Turkish salep. Have you ever had it? It’s thick, viscous, and quite delicious powdered wild iris root mixed with hot milk and dusted with cinnamon. Went well with the winter white landscape!